What's next for Web Offset? 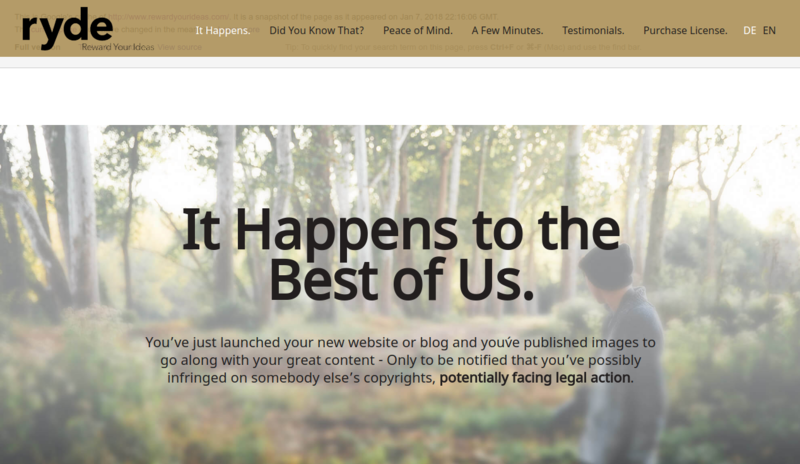 After decades of fierce competition, plus bitterly fought legal battles over dumping and intellectual property, the shareholders have concluded that this consolidation is the right step forward. Long gone of course are memories of billion dollar revenues in a mature but cyclical market which is now seen as in steady decline. Goss owner AIP pegs Goss at $210 million revenue while MR owner Possehl reports sales of Euro 235 million for 2017. With the new equipment market probably around $250 - $300 million and a handful of competitors like KBA, Komori, Manugraph etc. still active, it is obvious that the aftermarket business generated by the combined company's large installed base of newspaper and commercial presses will be central for the future. While the two companies are pretty close in terms of revenue, the publicly available headcount numbers differ quite a lot, with AIP providing approximately 600 employees for Goss vs 1248 employees reported by Possehl for Manroland. It should be noted that the Goss numbers most probably include Contiweb which will not be part of the transaction, while the MR numbers include some operations which have been outsourced at Goss. Friday's press release talks about more than a 1,000 employees combined, obviously leaving some room for further consolidation as the company will surely rationalize its remaining global footprint. With Augsburg and Durham being the remaining production sites it is not difficult to see the next consolidation scenario. Congratulations to Bert Schoonderbeek and his team who have successfully managed the Contiweb business for many years, whether being part of Heidelberg Web or Goss, and hopefully now have an opportunity to position the stand-alone company for its next phase. Over the years all press manufacturers offered every conceivable variation of cut-off, web width, inker configuration and folder capability, allowing printers to choose equipment that promised a marginal productivity advantage for any given business investment scenario. While most productivity improvements were evolutional, gapless printing resulted in large step function productivity gains and became the dominant technology in high-volume heatset, especially in the 2-around markets in the Americas. Those who can appreciate the complexity of printing and folding at speeds of over 50 km/h will understand the engineering effort necessary to provide the support for this type of equipment, even if it just means addressing obsolescence issues, let alone the development of new technologies. 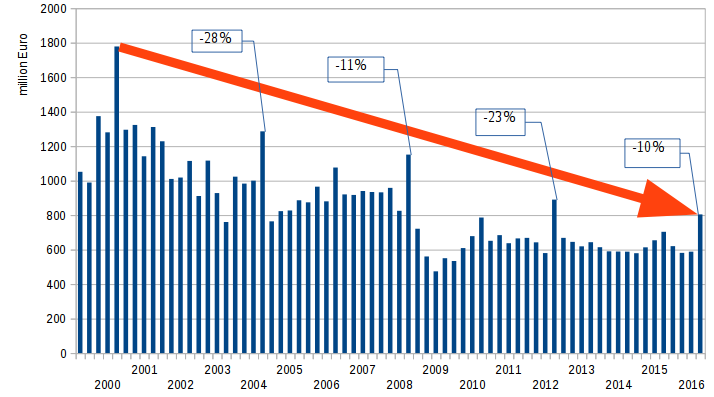 It is already becoming apparent that the current business volume does not support much new development, with the 96-page/64-page short grain gapless presses being the last major productivity innovation. And that was ten years ago. 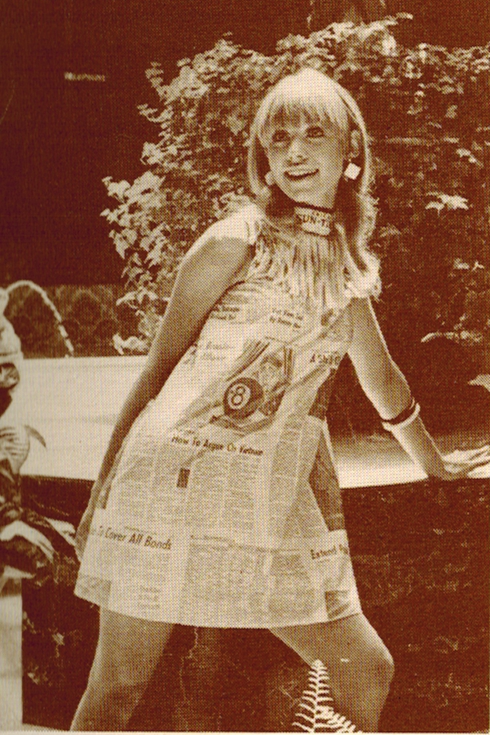 Newspapers have not seen anything new since 4x1 hit the market in its gapless and mini-gap variations. Let's hope that the management will have a lucky hand providing competent technical support for the wide range of products still in the market as well as an adequate product portfolio for the remaining new equipment customers, while pursuing the unavoidable product rationalization process which will go beyond the obvious M-600 vs Rotoman model debates and will include control systems, folder and drive concepts. Maybe the lack of innovation and potential limitation of product choice will not matter as printers continue their own consolidation process, with the German market also following the long-term trend in the US and Europe. Consolidation often results in internal redeployment of equipment rather than new equipment orders. 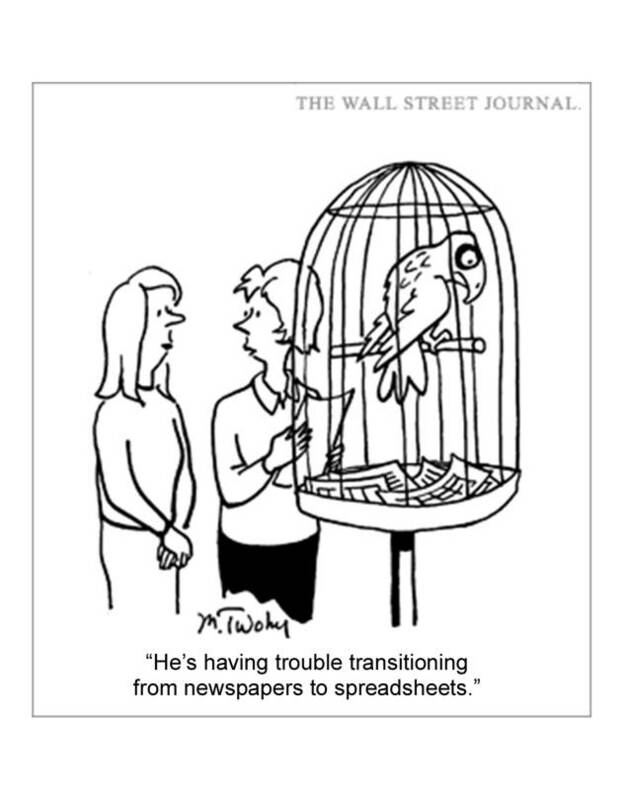 And newspapers may just be happy to extend the life of their machines through rebuilds and reconfigurations. Not a great outlook for any equipment manufacturer, but probably a good reason to merge and focus on the aftermarket. Good luck to the new company! Will the Supreme Court's Lexmark decision change the digital printing equipment business? On March 30th the Supreme Court overturned a previous patent win for Lexmark and ruled that once a patented item has been sold once, the patent is "exhausted" and can no longer be enforced. Printers, being used to buying consumables for their offset equipment independent of the equipment manufacturers, have always balked at the idea of being tied to one manufacturer for ink. With inkjet ink exceeding the cost of a good French or Californian bottle of wine, it is certainly understandable that companies are looking for the lowest cost supplier. However, the idea of loosing your warranty if you get caught using cheaper ink has been an effective deterrent and chip coded cartridges have not made it easy to live outside the rules. Of course, we also know that for a process as complicated as printing (digital, offset or any other variant) to work well, control of the environment is key. How many complaints about print quality have been reduced to paper quality, ink tack or other consumable parameters and how often has an inferior third party spare part with the same geometry (special grease filled bearings come to mind) been found to be the cause of an equipment breakdown? So, there are clearly two sides to the issue. But with this ruling, printers are now free to wander off the reservation of their HP or Kodak approved supplies and the days of a business concept based on "lifetime margin", giving away the equipment and generating the margin on the revenue stream of supplies, are probably over. Digital printing equipment is now being treated just as other printing machinery has been treated forever. Chief Justice Roberts used the auto industry as an example where manufacturers cannot control what people can do with a product after the sale. It will be interesting to see if somebody will challenge the closed "eco systems" like Apple's down the road. A look at the recent results of the major offset equipment makers confirm that life continues to be difficult for the industry. While the cost reduction efforts appear to pay some dividends, the overall market continues to be in a continuing decline. Last year's DRUPA effect was dampened by the continuing weakness of the Chinese and Brazilian markets. Manroland Sheetfed recently communicated upbeat news, but the 33% drop in backlog compared to 2015 suggests that orders dropped from Euro 323 million to below Euro 290 million in the DRUPA year, about half of what Heidelberg typically books in a quarter. Heidelberg's equipment segment saw quite a bump at DRUPA, but the next two quarters were business as usual, at best. The chart below compares quarterly orders for equipment and services. It is no secret that all manufacturers are looking to increase their services segment to reduce cyclicality and a look at operating performance shows the struggles Heidelberg still has to make money with its machines, despite its leading market position. The Euro 60 million peak in Q1/15 (Q4 of HD's fiscal year) was driven by blow-out sales of Euro 518 million, followed by average quarterly sales of Euro 309 million for the following seven quarters, leading to the not-so-special insight that manufacturing volume is the key to profitability. Given an even better backlog position than at the end of 2014, another big fourth fiscal quarter (followed by the usual trough) is certainly possible, however the question remains if the equipment segment can generate performance if quarterly sales settle in at Euro 300 million or below in the future. KBA's fourth quarter results are not yet available, but comparing the last four quarters at the end of Q3 with the same period a year earlier, sheetfed and web orders dropped some Euro 90 million each, or 15% for sheetfed and 41% for web orders, another sign that the market was challenging in 2016. Once the full year numbers become available I will update the overall comparison of the major offset players. Q2 reports are out and provide an opportunity to compare the usual DRUPA hype with the numbers. Conversations at the show appeared to confirm that the future is digital and the present is offset, however the absence of any web press confirmed the rather sobering outlook for that segment of the industry. Of course, this week's report of further drops in global newspaper ad spending will not fuel optimism for high volume printers. But back to DRUPA. Business for the sheetfed manufacturers appeared to be solid at the show, driven mostly by packaging. The graph below shows total orders for the main players in sheetfed, but should be taken with a few caveats. KBA orders include the web and special segments. 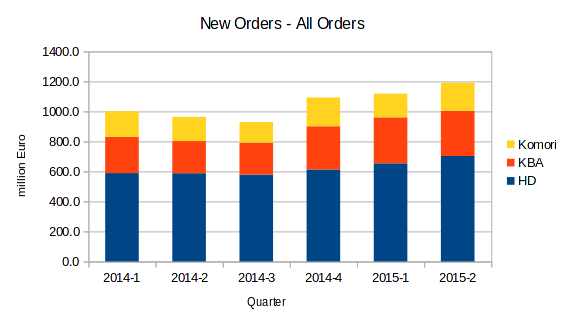 Sheetfed orders are about 44% of the total. Ryobi/Mitsubishi, now rebranded as RMGT (RYOBI MHI Graphic Technology is a mouthful...), only reports sales and Manroland sheetfed provides only limited insights, so I had to apply some estimates. Yes, the quarter is up, but does this mean better times ahead? 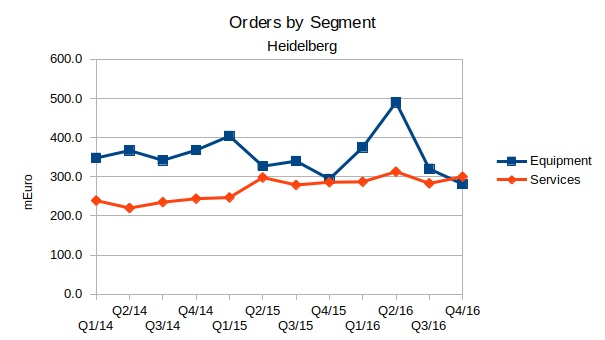 Heidelberg's long-term quarterly orders have always provided a clear illustration of the DRUPA effect, and it is also visible in 2016. However, it should be noted that the DRUPA peaks are lower and lower, and this year Q2 orders were about 10% lower than at DRUPA 2012. For equipment alone, the drop from last DRUPA was a sizeable Euro 100 million! Obviously, quarterly orders have stabilized for Heidelberg over the last few years, but it remains to be seen if the next quarters will continue to come in around the 600 million Euro level or will be lower again. 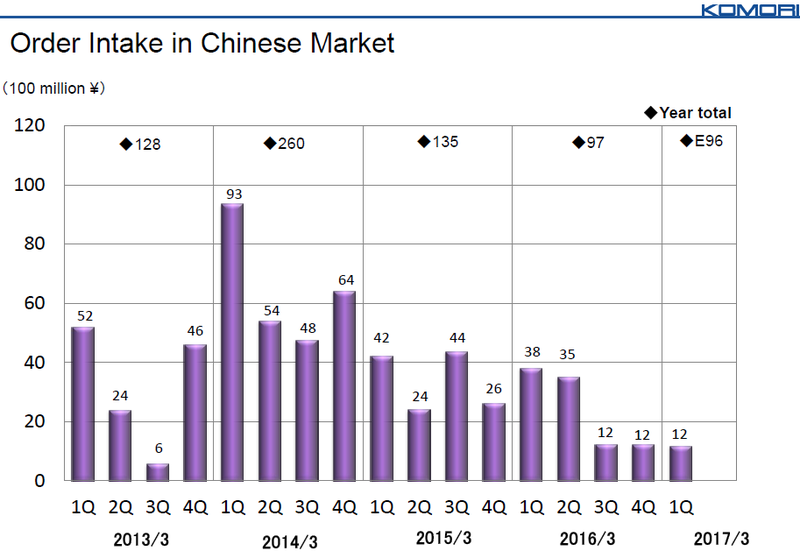 The well known weakness in China is certainly holding all manufacturers back, as illustrated clearly in the graph from Komori's quarterly report below. Following DRUPA, Heidelberg reports "Incoming orders of € 804 million boost order backlog by 67 percent." True, but equipment shipments for the quarter were low at Euro 215 million, or 54% of the previous quarter, which happened to be last quarter in the fiscal year and resulted in a low beginning backlog. As pointed out before, HD equipment orders were actually Euro 100 million lower than in the DRUPA 2012 quarter, clearly a sign for concern. 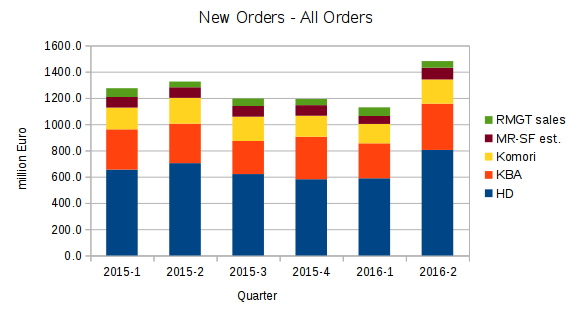 On the positive side though, compared to the average of the preceeding four quarters, equipment orders were up over 40%. The same cannot be said about HD's competitors. Using the same measure, Komori's sheetfed orders were down almost 14%. The company also reported its first quarterly loss in 3 years. So did its smaller rival RMGT, suggesting that pricing for the Japanese suppliers is more difficult in a strong Yen environment. All in all, I will not be surprised if, in a couple of years, we will look at DRUPA 2016 as the beginning of the next down cycle for printing equipment. I hope that I am wrong. That may have been what the participants of last Friday's Kodak Analyst and Investor Day may have asked themselves in case they know the title of the British comedy game show. Apparently investors did not like what they heard and reduced the stock market value of the company by some 36% over the next three sessions. The - in Kodak's case not exactly new - explanation is that the old cash cow businesses continue to shrink faster than anticipated and the new growth businesses do not grow fast enough. Revenue guidance for 2015 is now $1.8 to 2.0 billion, compared with $2.7 billion under the long scrapped 2013 post-bankruptcy plan. Beyond that some quite interesting details were discussed. New Prosper 6000 machines average about $3.5 million in sales value and currently still generate a loss, but it supposedly is still a great business because of about $1 million in annual ink and services provided by Kodak. While I have always been impressed by Kodak's Stream technology, one has to ask if this cost model will really allow Kodak to convert many of the "old iron" sheetfed and web presses to digital, or if printers will invest only when they need to print variable data. For most printers cost per copy is still the magic word. Let's also not forget that these machines fit somewhere in between sheetfed and web when it comes to plain productivity, so the real addressable market for this remarkable technology may be smaller than hoped for. The continued delays in getting the growth businesses to take off resulted in further negative cash flow, apparently including some customer financing to jump start growth. All in all cash has gone down from $844 million after emerging from bankruptcy to $521 million at the end of September. The published results for the first half of 2015 show an improved order situation for the major printing equipment manufacturers, albeit far below the levels of before 2009. Heidelberg shows the biggest overall increase and continues to be the undisputed market leader by sales volume. In terms of profitability the picture is also turning for the better. Having been profitable every quarter since the end of 2012, Komori has clearly adjusted fastest to the smaller market for printing equipment. Heidelberg reported a black zero in March '14 but continued restructuring in 2014, resulting in a net loss despite improved operating income. But it is a first in a number of years that Heidelberg achieved a positive operating result in the first quarter of this fiscal year. With increasing orders and backlog, profitability for the year should not need to depend on a blow-out fourth quarter. KBA continued the same "weak first fiscal quarter" pattern, even though the company has a different fiscal year than HD. While the second quarter was positive, the year-to-date operating results are still in the red. 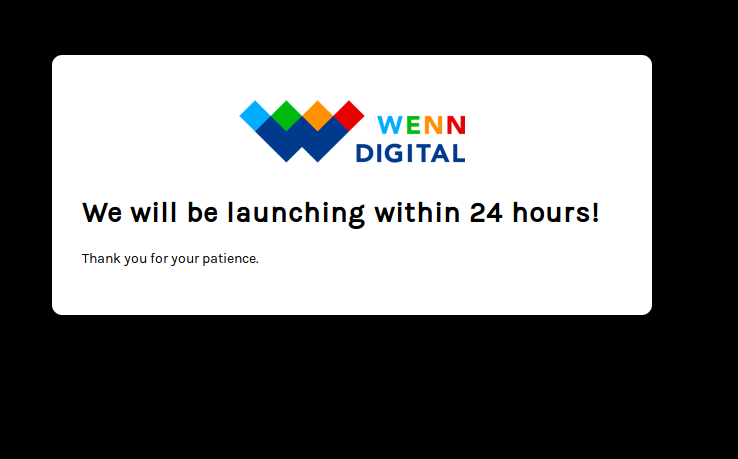 After much debate the company is now reporting its web and special press results separately, confirming its diminished role in a much smaller web offset market. The Special business segment includes KBA's envied security printing business (as well as flexible packaging and metal decorating) , but reported a modest EBIT of Euro 3.6 million on sales of Euro 170 million. Maybe an indication that Komori's efforts to become a serious competitor is paying off. Komori reported a security press order in each of the last four years. With all the gloom and doom in the world the new order development is positive. Of course, the exposure to the Chinese market is risk that everybody is certainly aware of. An industry that can’t earn a return on capital can’t attract capital in a crisis. This statement stood out for me in today's WSJ article commenting on the likelihood of further consolidation given the political meddling at a national level in the global auto industry. I have not posted anything since January, quite frankly because my reports and comments on some of the major players in the industry started to sound repetitive. 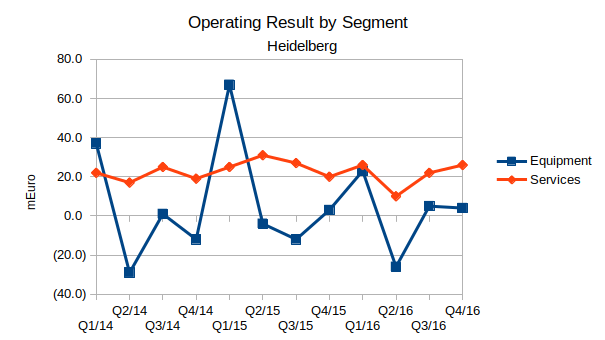 The sheetfed market leader Heidelberg every year seems to work its way through three meager quarters and manages a strong fourth to report results that are far away from sound profitability. "Kurzarbeit" (short work hours) appears to have become a normal capacity management tool for the German part of the industry, instead of the originally intention to use taxpayer money as an exceptional measure to help companies weather a temporary low cycle. Order announcements for the web offset equipment makers are conspicuously rare and offer an indication that their customers are still more focused on consolidating the industry than upgrading their equipment. Market information is limited and HP's last press release from 2013 stating a number of 100 inkjet presses installed since 2009 is surely outdated. But the relatively low number (even adding the 6,000 Indigo machines that were installed over a much longer period) makes you wonder about the longer term strategic relevance of commercial digital web printing for a company with $111 BILLION in annual revenue. It is now seven years since DRUPA 2008, the event that marked the beginning of the dramatic contraction of the printing equipment industry. While the companies themselves have shrunk and some have even gone through bankruptcy processes, the basic landscape of the industry has not changed. I find that quite surprising after seven years, especially since the industry is small enough that political objections - like in the auto industry - would probably be minimal. Normally one would expect investors to drive more consolidation, that is of course only if they believe the industry can provide a return on capital. 2015 promises to be another year of surprises, hopefully bringing more good than bad ones. While I leave the forecasting to the professional tea leaf readers, it is always worth taking a look at currencies this time of year. 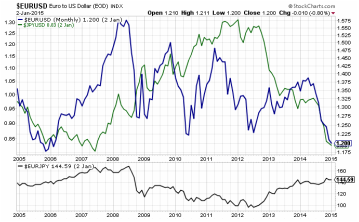 The chart below shows the development of the Japanese Yen (green) and the Euro (blue), both vs the US-$ over the last 10 years. The black line in the lower box depicts the Euro-Yen relationship. Obviously, the dollar has appreciated against both currencies over the last half year, but for the last two years the Yen valuation has been completely reversed and a Euro today buys 145 Yen vs about 100 Yen two years ago. That won't make life any easier for European manufacturers competing with Japanese companies, never mind US digital or offset equipment makers. However, with the US-$ being the strongest since DRUPA 2012 and the US economy having an overall improved outlook, US printers may well look at ending their capex hiatus and modernize their plants again.